Ewen is a responsive HTML5 Parallax template best suitable for any startup, creative, corporate, consultancy or other similar business. 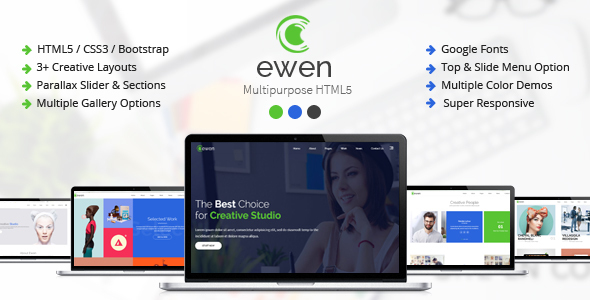 Ewen will help you to make any website like creative or corporate agency, financial consultant, portfolio company, agency or other business very easily as it has been coded in Bootstrap and CSS3. This template comes with 3 unique home variation with 3 different navigation styles. Also, About, News, Services, Portfolio , Testimonials, 404 or others essentials pages are included. Ewen is super responsive to all of the devices and will suite the startups as well.